I decided to do this project for several reasons: first I like music, second I have a ton of MP3 and third I wanted to be able to listen those in my living room. I began the project with one major restriction, the printed circuit board of MP3 player MUST be single side in order to do it myself. After 2 months of drawing, I saw that it was a possible project. One major characteristic of this player was the bi-directional remote control had to give these informations: directories and songs on a small graphic LCD. In the comfort of your chesterfield you can browse and listen to 30 gig of MP3. 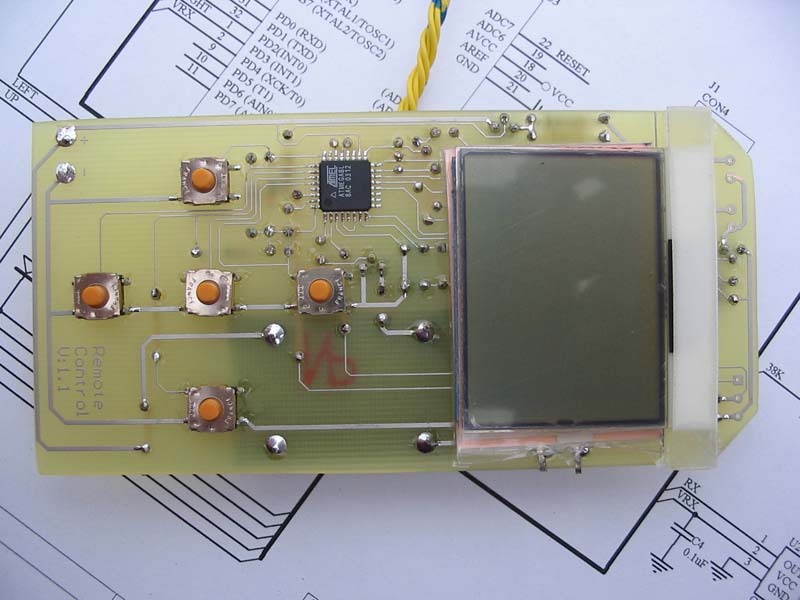 The MP3 player is built around an Atmel ATMega128 running at 16Mhz. The MP3 decoder is a VS1001k who gives a crystal clear sound. The USB interface is done via FT232MB who makes USB very simple. In this project I found two big difficulties: understanding FAT32 and transmitting a large quantity of information via InfraRed. - Windows software for checking the hard drive data on sector like WinHex. Devices liked GP1UD26xk (infrared sensor) needed to have a density of 1's lower then 45% so the Manchester encoding MUST be used combined with a speed of 2400bps maximum and 2 stop bits. Manchester encoding gives you 50% of 1's. Each time you send "1" you will send "10" and for "0" you send "01". The utilization of 2 stop bit by bytes will gives you approximately 45% of 1's. The fact is that you loose 50% of the original speed but that's the only way to do it. The ATA interface in PIO mode is very simple, if you know how to interface any MCU peripherals this is the same method. You have address bus who controls the register you wanted to write to or read from with a 16 bits data bus. -MP3 Player Bootloader source code for MegaLoad in ICCAVR format "via usb"